In an interesting way to educate people and feed the poor at the same time, FreeRice.com has a deal. You learn new words and their synonyms and for each one you get right, they will donate via the United Nations 10 grains of rice. Now you might think how are they doing this? The money comes via the ads at the bottom from sponsors such as Fujitsu, Apple and Time. If you thought to yourself, “Man, 10 grains of rice!?! I find that in my belly button daily!” well you are just a pig who needs a shower. 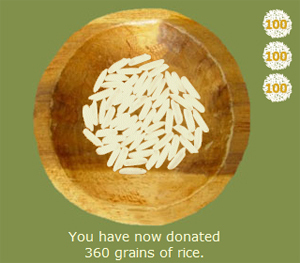 So far they have collected 164,650,960 grains with works out to over 3,000 kg of rice. That is a spicy meatball…. made of rice…. SHUT UP! Thanks to Cygnus183 for the heads up. I know you worried what happened and why there was no posts yesterday and Friday. Well a man I can truly say has been more gay with me than any other guy, AJ, came down for a visit. He is a fellow Henro who walked the Pilgrimage with me. Things should get back to normal today. If you are wondering what I mean by “has been more gay with me than any other guy”, I mean signing “Build Me Up Buttercup” while washing our 3 day unkept asses in the holiest river in all of Japan. That and all the buttsex.